Pursuing his investigations of WWII machinations, secret international agreements, breakaway civilizations and hidden wars in Antarctica, author and researcher Joseph P. Farrell examines the continuing mystery of Rudolf Hess, his sudden flight to Scotland, his supposed imprisonment at Spandau Prison in Berlin and how his flight affected affairs in Europe, Israel, Antarctica and elsewhere. Farrell looks at Hess’ mission to make peace with Britain and get rid of Hitler—even a plot to fly Hitler to Britain for capture! How much did Göring and Hitler know of Rudolf Hess’ subversive plot, and what happened to Hess? Why was a doppleganger put in Spandau Prison and then “suicided”? Did the British use an early form of mind control on Hess’ double? John Foster Dulles of the OSS and CIA suspected as much. Farrell also uncovers the strange death of Admiral Richard Byrd’s son in 1988, about the same time of the death of Hess. 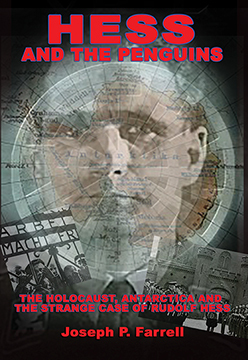 What was Hess’ connection to Antarctica? It is Farrell at his best—uncovering the special operations and still-secret activities of WWII and the breakaway civilization. Topics include: A Death in Spandau; The Autopsies; Anomalies Noted by Hess’s Son, Wolf Rüdiger Hess; Hess, the Haushofers, “Geopolitics,” and the Thulegesellschaft; The Stellvertreter: Hess’s Power within the Nazi Regime (1933-41); Nonsense at Nuremberg and Difficulties of Doubles; Foretastes of MK-Ultra: Allen Dulles and Hess at Nuremberg; “Hess’s” Strange, Buffoonish Behavior at Nuremberg: “Brain Poison” and Hess’s “Jewish-Bolshevik Mind-Control Conspiracy”; The Real Hess Parachuted into Scotland;, Hess, and the Grand Dame of Conspiracy Theory; The Israelis and Hess; Hess, Halifax, Chamberlain, Churchill, the Reichs-kristallnacht, The Balfour Declaration, and the “Jewish Question”; Lord Victor Rothschild, Heinz Schön and Operation Highjump; A Brief Review of Antarctic Strangeness; Disturbing Questions about Highjump; The German Antarctic Expedition and State Councilor Wohlthat; The Post-war American Expedition of Admiral Richard Byrd in 1946-47; The Operational Plan of Highjump; The Strange Death of Admiral Richard Byrd’s Son; What About Norway? ; tons more.